Baylor>Department of Religion>Our Faculty>Faculty>Scott Ryan, Ph.D.
Scott Ryan recently graduated with a Doctor of Philosophy in Religion from Baylor University, writing his dissertation under the supervision of Dr. Beverly Roberts Gaventa on the apostle Paul’s adaptations of Jewish divine conflict motifs in the letter to the Romans. Early in 2019, Scott’s dissertation, Divine Conflict and the Divine Warrior: Listening to Romans and Other Jewish Voices, will be published by Mohr Siebeck in the Wissenschaftliche Untersuchungen zum Neuen Testament 2 series. 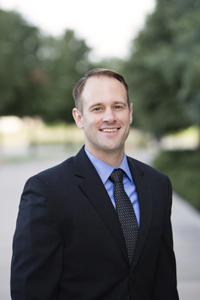 He received the Outstanding Dissertation Award at Baylor in 2017–18 and the Outstanding Graduate Student Instructor Award in 2016–17. Currently, Scott serves as the Wabash Fellow in Religion in the Department of Religion, teaching undergraduate courses and overseeing a teaching initiative designed to increase faculty participation in mentoring graduate students for the teaching vocation and to advance knowledge of pedagogical strategies among faculty and students. Prior to coming to Baylor, Scott completed the Master of Divinity and Master of Theology degrees at Duke University Divinity School, where he received the Excellence in Bible Award. He also holds a Bachelor of Arts in Religious Studies from Gardner-Webb University, where he received the Greek Award and the Christian Service Award. Scott has published his research in journals such as New Testament Studies, Perspectives in Religious Studies, and Baptist History & Heritage, and presented a number of times at professional conferences. He was selected as a Young Scholar in the Baptist Academy in 2015 and received the Schmeltekopf Fellowship for Educational Leadership in 2013–14. His primary research interests include the Pauline Letters, the Gospel of Mark, Israel’s Scripture and Traditions in the New Testament, Material Culture, Literary and Rhetorical Criticism, and Reception History.